No two people are the same biologically, and your healing capabilities are in many ways a reflection of your unique medical background. Generally speaking, though, most doctors advise patients to seek treatment if the wound hasn’t fully closed within four to six weeks. However, there are other factors that may influence your decision to seek out treatment sooner. If you aren’t up to date on certain vaccinations – like tetanus – it’s a good idea to get checked out. Similarly, certain early warning signs, like pus or swelling, may indicate a potentially harmful infection. If ever you’re not sure, err on the side of caution and reach out to your doctor or wound specialist immediately. 2. What are the most common causes of non-healing wounds? Wounds are inherently complex; a number of biological systems have to work in balance for a wound to heal properly. If any of these mechanisms were to malfunction, the results can be felt far beyond the wound site. For instance, a lack of circulation can prevent wounds from closing, as your blood carries vital cells and helps remove debris and toxins. Your ability to heal may also slow down as you age or if you’re suffering from a number of ailments, like peripheral vascular disease or chronic lung disease. There are several outside factors that can also affect a wound’s closure. Certain medications can block important healing processes, while a lack of nutrients – namely zinc and vitamin A – can keep the body from creating vital proteins. 3. What are the most widely preferred wound care therapies? As mentioned above, immune function can vary significantly from person to person, and thus the kind of care you’ll require may differ from the therapy prescribed for someone else with a similar wound. Still, a large percentage of wound care regimens begin with debridement, in which dead tissue and debris are removed. From there, your physician may rely on any number of dressing options, and each has its own inherent benefits. For instance, hyrodcolloid dressings are noted for being both adherent and especially absorbent, while hydrogels may be relied on more to aid in autolysis. There are also some non-dressing options for wound healing. Hyperbaric chambers expose patients to increased levels of oxygen, which bolsters healing, while some physicians may rely on bio-engineered tissue substitutes for more severe wounds. 4. Who is most at risk for chronic wounds? Nearly 7 million Americans live with chronic wounds, according to the U.S. Centers for Disease Control and Prevention. Yet the population that this figure represents is comprised of a wide array of people with any number of health conditions. People with diabetes are especially susceptible to chronic wounds. In fact, according to a 2009 study published in the journal Wound Repair and Regeneration, nearly 15 percent of all diabetes patients suffer from chronic wounds, most notably foot ulcers. 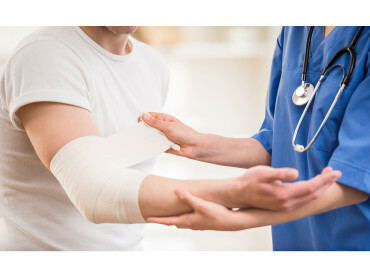 Other conditions associated with chronic wounds include peripheral neuropathy, diminished vascular disorders, pressure ulcers, osteomyelitis – an infection of the bones – and even certain kinds of bug bites, including ticks, mosquitos and spiders.